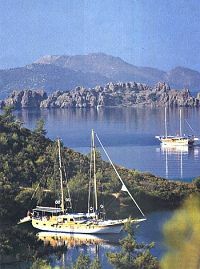 Gocek is blessed with a magnificent scenery. Imagine for a moment you had your own yacht - and with it complete freedom to visit any of the beauty spots along the stunning Turquoise Coast without the need to worry about practicalities such as road access or suitable accommodation on land. Then consider how many of those who do have exactly this privilege choose to visit Gocek again and again and you will realize that this must be a very special place indeed. 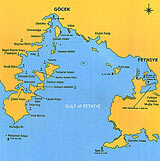 The islands also provide further shelter for Gocek's almost circular bay which has made the village such a perfect natural harbour. Lured by such perfection, the yachting community has made Gocek a favourite - amongst them such luminaries as President Özal and Britain's Princess Margarete - and it is also a popular stop for gulet cruises. Perhaps this explains Gocek's impressive range of facilities for a place that remains so blissfully untouched by the trappings of large-scale tourism: there are less than a handful of small hotels and less than a dozen even smaller pensions, and no building stands more than two storays tall. Yet all along the wide, immaculately landscaped promenade that fringes the quayside, there is no shortage of cafes to excellent restaurants specializing in delicious freshly fish caught in the bay that same day. In the backstreets and around the old village square by the mosque, there is a surprising array of shops. You will find colourful greengrocers and fascinating art and crafts shops, carpet bazaars and exclusive jewellers, designer boutiques and shops selling hammocks, even a traditional village barber should you fancy a really close shave! There is also a handful of atmospheric cocktail and jazz bars, hut noisy, boisterous entertainment does not feature on Gocek's menu: by local law, all bars must turn down their music by 11:30 p.m. so as not to be audible from outside and must close altogether by 02 am. With its charming, laid-back atmosphere, Gocek is the sort of place where you can happily while away whole lazy days watching the world go by from a quayside patisserie, but life does of course revolve around the sea here. From the harbour you can take boat trips around the Twelve islands and a boat is also the natural choice of transport to reach.Gocek's beaches. at the bottom of the sea, where the ruins are, before the wind starts very early in the morning, you can see the sands at the bottom are still a bit moving. This means that there is still a bit amount of hot water coming out today. If you want to try your chance to be as beautiful as Cleopatra and to look 10 years younger(! ), you are allowed to swim around and in the ruins!!! Given Gocek's unspoiled charm; you might think it would take a great effort to reach this idyllic haven, but it is only just half an hour from Dalaman airport and the Gocek tunnel is ready since middle of 2006. Less than an hour's drive takes you to Dalyan with Caunos and the Rock Tombs in the west or the deserted ghost town of Kayaköy near Fethiye. With so much in its favour, it is almost a miracle that Gocek has not been swamped, by the developers.